The Corfu Declaration is the agreement that made the creation of the Kingdom of Yugoslavia possible. In 1916, the Serbian Parliament in exile decided the creation of the Kingdom of Yugoslavia at a meeting inside the Municipal Theatre of Corfu, Greece. The declaration was signed near the end of World War I on the island of Corfu on 20 July 1917, by the Yugoslav Committee of politicians in exile, that represented Slovenes, Croats and Serbs living in Austria-Hungary and the representatives of the Kingdom of Serbia, with political sponsorship of Great Britain and France, under their avowed principles of national self-determination. 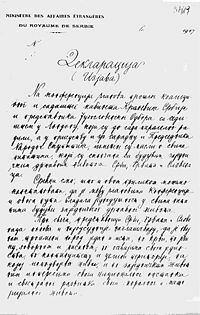 The Declaration as "the first step toward building the new State of Yugoslavia" envisaged a parliamentary monarchy under the Karađorđević dynasty, with indivisible territory and unitary power, with the three national denominations and the Latin and Cyrillic alphabets equal before the law, religious freedom and universal suffrage. It provided for a Constituent Assembly to establish a Constitution that would be the origin of all powers. "This State will be a guarantee of their national independence and of their general national progress and civilization, and a powerful rampart against the pressure of the Germans", the Declaration concluded. The two chiefly responsible for devising the wording of the Corfu Declaration were the Serbian Prime Minister Nikola Pa�ić and the Croatian exile Ante Trumbić, who worked to overcome official Serbian resistance. Pa�ić and the Serbian Court Party had remained intent upon the simple expansion of a Greater Serbia by means of unilateral territorial gains to be derived from a beaten Austro-Hungarian Empire. The outbreak of the February Revolution in Russia had withdrawn Serbia's Major Power champion from the diplomatic table. Pa�ić compromised, signed the Declaration and began to work behind the scenes in an attempt to discredit the Yugoslav Committee, lest the Allied Powers regard the Committee as the rightful government-in-exile at the coming Armistice. As a consequence, the Kingdom of Serbs, Croats and Slovenes was created on December 1, 1918. Trumbić was named Foreign Minister, and Pa�ić found himself temporarily out of power.